CDPHP has prepared the following questions and answers to save you time and help you do your job. Q. If a claim is submitted by a provider who is billing ICD-10 codes prior to 10/1/15 or ICD-9 codes after 10/1, what is the process to have the claims adjusted? A. Claims billed incorrectly with ICD-9 codes after 10/1 or ICD-10 codes prior to 9/1 should be billed as new claims and not corrected claims. Q. 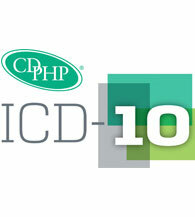 Can CDPHP help me determine which ICD-10 code is appropriate if I provide the ICD-9 code? A. CDPHP cannot give providers specific ICD-10 codes. Providers will need to refer to the ICD-10 coding books for guidance in selecting appropriate coding based on their medical documentation. GEMs (General Equivalency Mappings) are also available on the CMS website for further guidance regarding appropriate ICD-10 codes. Q. Do ICD-10 codes impact dental providers? A. Yes. If a dental provider is billing a claim with a medical or surgical diagnosis, they will be required to use ICD-10 coding. Additional information can be found on the Delta Dental website. Q. How are we handling authorizations? Is the process the same for prior authorizations submitted through eviCore (formerly MedSolutions)? If the actual date of service starts prior to ICD-10 and crosses through 10/1, the authorization will be loaded with ICD-9 coding and will not need to be updated. If the authorization request is for services that occur after 10/1, ICD-10 coding should be used for that authorization. If a subsequent request comes in for additional services on or after 10/1, the authorization will be coded as ICD-10. Inpatient admissions and services that are known to begin on or after 10/1 will be coded as ICD-10. The process is the same for authorizations obtained through CDPHP and eviCore. Q. How will ICD-10 coding impact DSM IV codes for behavioral health providers? Will they be required to move to DSM V codes? A. Behavioral health providers are required to bill using ICD-10 codes. These providers will sometimes refer to DSM code books to obtain the appropriate ICD-9 codes. DSM V will assist with obtaining the correct ICD-10 coding. Providers are encouraged to refer to the ICD-10 book for appropriate coding. GEMs are available on the CMS website for further guidance regarding appropriate ICD-10 codes. Q. Is ICD-10 applicable to Medicaid and Medicare lines of business? A. Yes. ICD-10 applies to all lines of business, including Medicaid and Medicare. Q. What is the appropriate way to bill an inpatient claim that begins prior to 10/1 and ends after 10/1? A. Inpatient claims must be billed using the appropriate diagnosis coding based on the discharge date. For example, if a member’s inpatient stay begins on 9/30/15 and ends on 10/2/15, the claim must be coded using ICD-10 coding. Q. What is the appropriate way to bill an outpatient claim that begins prior to 10/1 and ends after 10/1 (e.g., emergency room or observation stays)? A. Following CMS guidelines, outpatient claims should be billed separately for dates of service prior to and after 10/1. Services provided prior to 10/1/15 should be coded using ICD-9 and services on or after 10/1/15 should use an ICD-10 code. Additional information can be found in MLN Matters Article Number SE1325. Q. Won’t splitting these types of claims result in overpayments if a provider has a global or inclusive rate? A. No. If a provider has an agreement that normally pays a “global” allowance, this allowance will be paid on one of the two claim submissions. The subsequent claim will be denied as global.